When I'm at work and my husband's at home (which is happening more and more frequently now), we communicate via Facebook. I have a laptop with an external monitor, so I work on the monitor and the laptop is off to the right. Since I rarely use its screen, I have Facebook open on it so that I can see when my husband's talking. 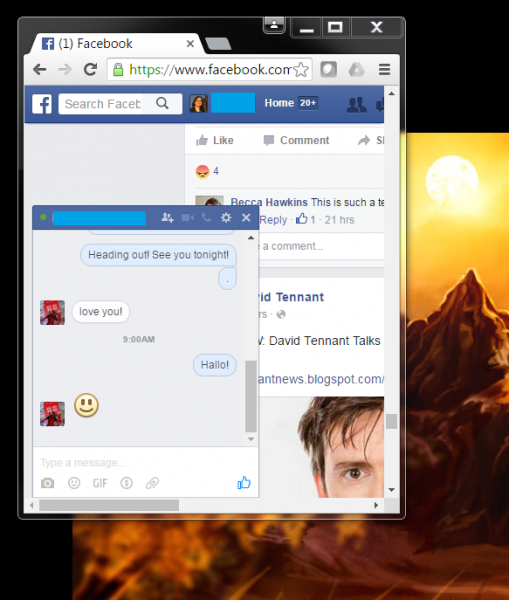 I also have a rotating DW background set, so I keep the Facebook screen small - just large enough to show my husband's chat window and the notifications in the top bar. I guess I'm being spied on by somebody. I can think of worse fates. Or somebody's watching over you.... certainly not a bad thing. *CACKLES* at least it's a 'stalking' by someone you rather adore!